A perfect complement to Process Instrumentation I, or as a stand alone, the Process Instrumentation II textbook covers symbology, control loops and related topics including a brief introduction to PLCs and continuing with its applied workplace approach there is an overview of troubleshooting as well. Does your curriculum require additional topics not included in this textbook? 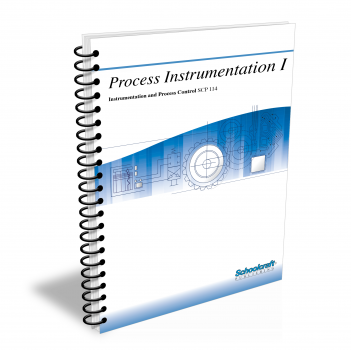 Build a customized version of the Process Instrumentation II textbook below. Recognize standard symbols used in process control diagrams. Describe a process control system through the use of instrument symbols. Recognize and use four kinds of process control diagrams. Analyze a process control drawing for the elements, signal flow, and process flow. Convert sequence-of-operation text to a flowchart. Read electrical and electronic control diagrams and drawings. Recognize symbols used on electrical and electronic diagrams, including those for PLCs and SAMA logic. Convert electrical diagrams to PLC diagrams. Discuss the role of computers in process control. Describe the difference between continuous and discontinuous control modes and give an example of each. Describe the action of the various continuous control modes. Define proportional band, reset time, and rate time. Discuss the advantages of each of the combination control modes. Name several advantages of digital controllers. Discuss the differences between supervisory control, direct digital control, and distributed control systems. Describe how a cascade control system works. Identify the primary and secondary variables in a cascade loop. Compare feedforward and feedback control. Identify dependent and independent variables in ratio control. Explain the advantage of having a secondary control loop in ratio control. Describe how a multivariable control system works and define interaction. Describe two kinds of process time lags and give an example of each. Discuss the effects of capacitance and resistance on loop dynamics. State the three main objectives of a well-designed process control system. Describe how PI, PD, and PID controllers are adjusted to achieve optimum response. Discuss the effects of system gain and phase shift on system stability. Discuss the classification of hazardous locations as identified in the NEC Handbook. Define volatility and flash point, and explain the purpose of a purged enclosure. Describe two kinds of explosion-proof enclosures. Discuss ways of making a system intrinsically safe. Describe examples of fail-safe mechanisms, and differentiate between hard and soft constraints. Compare latching and nonlatching alarm systems, and explain the function of annunciators. Discuss the purpose and operation of interlocked and sequential control. Define conductivity and discuss the basic principles governing conductivity. Compare the operation of electrode probes and inductive probes. Describe two procedures for calibrating conductivity probes. Discuss proper installation and maintenance practices for conductivity probes. Discuss the operation of stack gas analyzers. Describe pH and ORP measurement processes. Describe the instruments used for the measurement of pH and ORP. Discuss calibration procedures for pH and ORP measurement instruments. Discuss general installation and maintenance procedures for pH and ORP measurement instruments. Describe the components that make up an optical analyzer. Discuss the basic operating procedures of silica ion and COD optical analyzers, turbidimeters and nephelometers, refractometers, and capacity analyzers. Compare procedures for calibrating an optical analyzer with standards, with grab samples, and electronically. Discuss installation considerations and basic maintenance procedures for an optical analyzer. Identify the main components in the combustion process. Describe the various kinds of instruments used for measuring the products of combustion. Discuss the principles of operation of instruments that measure the products of combustion. Describe the basic maintenance procedures for instruments that measure the products of combustion. Discuss the various sampling techniques for measuring the products of combustion. Discuss the principles of chromatograph operation. Describe four kinds of detectors used with chromatographs. Describe four kinds of liquid chromatog raphs. Explain how to read a chromatogram. Discuss chromatograph calibration techniques and identify variables that can affect chromatograph accuracy. Discuss the history of the application of computers to continuous and batch process control. Describe the function of an RTU in a SCADA system. Describe the development of distributed control systems from microprocessor-based instruments, including programmable logic controllers. Compare the hardware, operating systems, software, and applications of a PC with a household VCR. Compare the concepts of artificial intelligence, expert systems, and fuzzy and crisp logic. Describe the various kinds of small computers used in process control. Explain how a "smart" device differs from its conventional counterpart. Discuss the similarities between microprocessor-based instruments and conventional instruments and list several advantages of microprocessor-based instruments. Describe the roles of two kinds of PCs (programmable controllers and personal computers) in process control. Topics: Importance of distributed control systems; Distributed control system hardware; Workstations; Remote processing units; Host/guest computers; Transmission system; Distributed control system software; Distributed control system reliability; Peripherals; What is fieldbus? Describe the elements of a typical workstation. Discuss the functions of remote processing units and host/guest computers in DCSs. Compare star, hub, and ring network topologies and token-passing, contention, and polling protocols. Explain why today's DCS users must be more computer literate than previously. Discuss ways of calculating and ensuring DCS reliability. Describe the functions of six typical DCS peripherals. List advantages and disadvantages of all-digital process control systems, such as fieldbus. Describe the basics of a simple configuration process. Discuss the preparatory steps required for configuration. Describe a typical hierarchical display arrangement and discuss the progression of the configuration process from level to level. Discuss the automatic configuration of auxiliary displays. Discuss the DCS functions for which the operator is and is not responsible. Discuss the development of integration in industry. Describe how continuous and discrete processes fit into the concept of total business integration. Describe the purposes of MAP and OSI. Discuss the functions of CAD, CADD, CAE, CAM, and cell control in discrete processes. Discuss the importance of FMS, MRP, JIT, and MMS in today's integrated industrial plant. Explain how SPC ensures quality control in open-loop processes. Discuss the advantages of integrating batch, continuous, and discrete processes throughout a plant. Explain how an understanding of the process and its instrumentation reduces troubleshooting time. List at least four kinds of information typically included in a manufacturer's manual or instruction book. Describe the contents of an instrument history file and explain its usefulness in troubleshooting. Discuss the kinds of tools, including calibration standards, you are apt to use in troubleshooting. Describe the steps in a typical troubleshooting procedure and explain how to use a branching troubleshooting chart. Compare methods of on-site and shop repair of malfunctioning instruments. Describe the differences between repairing, maintaining, and calibrating instruments. Describe the contents of an equipment history file and a process loop file. Discuss the benefits of failure mode analysis. Describe proper calibration procedures, including use of calibration seals, and explain what NIST-traceable means. Describe the typical main sections of an industrial instrument shop.